Pack everything you need for a Safari in this Safari Backpack! This craft is great scissor practice for preschoolers, or a great vocabulary builder for older children! 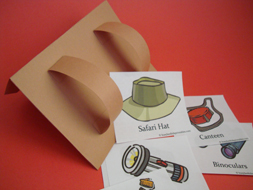 Print out just pictures of your safari supplies, or print out the picture with the vocabulary words, and put them all inside a paper backpack! * Instructions for printable: The printable will open in a new window; close this window when you are done printing to return to the activity page. You will need Adobe Reader to open the printable. If you do not have it you can download it for free here. 1. Cut about 2" from the long side of your construction paper - this will be the backpack. Cut the two corners off the top of your paper. Use the leftover paper to cut 2 strips for the backpack straps about 1" X 7". 2. Fold your paper into an envelope. The flap to open the backpack will be the top of the paper with the cut corners. Glue or staple the sides of the backpack to make a pouch. 3. Turn your backpack over. Fold tabs on the ends of each strap and glue in place. 4. Cut out your safari supplies and place them in your backpack!